When designing our main Swimming Safari location at Hodges & JTB, it was very important for us to create a hassle-free environment for parents and students. To do this we made special considerations when choosing our location and designing our pool and building. Our JTB & Hodges facility is conveniently located in the Windsor Commons Shopping Center on the corner of Hodges Blvd. and JTB (SR 202), right next to Publix! 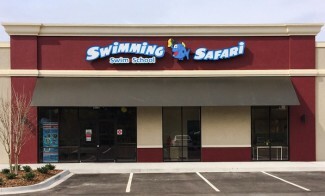 This close proximity to JTB and 295 makes our swim school a quick trip for many areas throughout Jacksonville. Our pool has been carefully designed to create a delightful learning environment for students of all ages and all skill levels. To create this atmosphere, we have designed one of the most advanced pool systems for heating, filtration, and sanitation in all of Northeast Florida. During the design phase, we consulted with the learn to swim industry and experts from all over the country about water quality and aquatic facility design to ensure our pool will always deliver warm, crystal clear, purified water and be at the foremost of industry standards. Water Temp: 90 degrees – easy to learn in! Size: 30 (w) x 66 (L) ft – large enough to do laps, for a good workout! Depth: 3.5 to 6ft – perfect for teaching swimming! Swim benches running the length of the pool for students to sit on – No hanging on to the wall! All 60,000 gallons are filtered every 90 minutes; 3.5 times the required rate – Exceeds industry standards! Computer controlled water chemistry systems – Better control of cleanliness of our water! UV filtration system which provides swimmers added protection by using light to eliminate harmful pathogens – the ultimate in sanitation! Salt sanitation system which eliminates the harmful effects chlorine can have on your skin, eyes, and clothing – Feels like bath water! Gone are the days of swimming lessons being subject to the elements, thanks to our 7,000 sq ft building. From the beginning, it was our goal to design a facility that creates a hassle-free environment for our parents and students. Lightning protection so we can safely swim during storms – Technical data shows safety protection! Several bathrooms / changing rooms. – Benches & changing tables included! Parent view room with floor to ceiling glass – Air-conditioned for viewer’s comfort! Complimentary WIFI – Keep up with the latest! Children’s play area - Keeping them busy! On deck showers – Rinse off before or after lessons! Retail area – Get your specialized goggles and diapers right here!